The annual Alumnae Induction marks the formal welcoming of the graduating class into the larger community of more than 7,000 alumnae. For the first time ever, the graduating seniors of the Class of 2019 will be able to celebrate this occasion with the entire school. This event is an invitation for alumnae to return to SHA to sponsor a graduating senior. Join us in celebrating Reunion 2019! 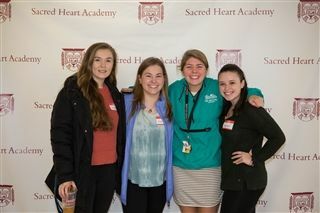 Come back to campus to reconnect with classmates and discover what's new at Sacred Heart Academy. Learn more and register online on the Reunion 2019 page. Kicking-off the year was the annual Legacy Luncheon, hosted by President Sr. Sheila O’Neill, Ph.D., ASCJ, ’71. This well-attended event was held on Open House day, to welcome back legacy families. Special thank you to Kris Triana Kirck ’88, P ’20 and Lisa Grasso Egan ’81, P ’21 for co-chairing. Friday, November 9, 2018 | 2:00 p.m.
Saturday, November 10, 2018 | 2:00 & 8:00 p.m. Originally called the “operetta,” the musical has taken place each year since the first students enrolled at the Academy in 1946. Today, musical productions are performed at the historic Shubert Theater in New Haven. Our musical theater program has been recognized with awards from the Broadway High School Theatre Guild and the prestigious HALO awards. Every alumna who attends any of the three performances receives something from the Alumnae office upon arrival in the lobby, and all alumnae are acknowledged before the curtain goes up. As always, our Alumnae at the Musical event drew a noteworthy crowd during our "Leader of the Pack" weekend. 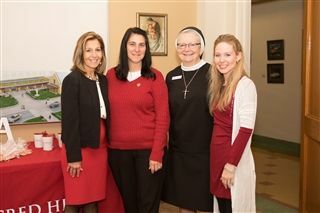 Thank you to Rita-Marie Rogers Rossetti ’87, P ’18, ’21 and the Future SHAlumnae Club for helping with this event. 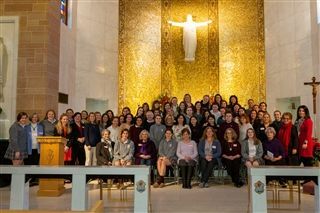 The Wednesday before Thanksgiving marks the annual Young Alumnae Return Day, the day when recent graduates from the past four years return to Sacred Heart to catch-up with classmates and teachers. Young alumnae will be welcomed home with the school’s famous break-time cookies and some hot chocolate. Their visit will include special time allotted for a meet & greet with former teachers. Lead volunteers Jackie DeGenarro ’18 and Allegra Sette ’18 ensured that alumnae packed the Chapel on Young Alum Return Day in 2018. Guests enjoyed socializing with faculty, staff, and current students. The SHA “break” cookies and hot chocolate were a highlight of the program! In the spirit of the season, the Alumnae Office is again sponsoring the Christmas Stocking Challenge so that alumnae near and far can continue to participate in this longstanding Sacred Heart tradition. Create your own stocking (or several!) and/or get your community, your employer, or your friends to create stockings to donate to your charity or charities of choice. Please join us in the SHA library on Monday, December 3 at 7:00 p.m. for a little festive fun, beverages and sweets for everyone! All alumnae are welcome as we assemble stockings for the annual SHA stocking drive! The 2018 Alumnae Christmas Stocking Drive was the biggest success to date. Thanks to chair Lisa Grasso Egan ’81, P ’21 and many alum volunteers, more than 200 stockings were filled for area children. The Legacy Mass takes place during a First Friday Liturgy and celebrates our current legacy families — generations of Excelsior Women — by honoring alumnae relatives of current students. 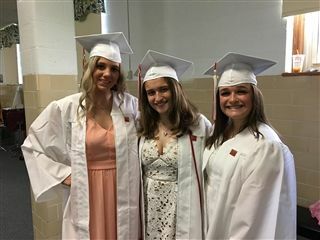 The auction has been Sacred Heart Academy's signature event since it began in 1991 as an annual fundraiser to make premier Catholic education affordable and attainable for all deserving young women. The auction always boasts a memorable evening with stunning staging, gourmet cuisine, and fine beverages. Guests have the opportunity to bid on and win an astonishing assortment of prizes, gifts, and must-haves of the year in the live and silent auction. This year's event is chaired by current parents Frank and Donna Sandillo P'20. To learn more, visit sacredhearthamden.org/auction. This liturgy is held in remembrance of a deceased alumnae of Sacred Heart Academy, and our founding principal, Sr. Antonine Signorelli, ASCJ. All alumnae are invited to come back to the Mount and honor the memory of their deceased classmates. Special invitation to the family members of SHA alumnae who have passed away this year. Special thank to our chair, Regina McFarland Johnson ’77. Due to limited parking on campus during construction, please do not arrive before 6:30 p.m., and park in the upper lot near the cafeteria doors. Strongbonds are everywhere! 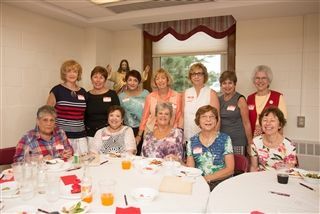 SHA alumnae can be found coast to coast, full of spirit and excited to reconnect with their alma mater. We are currently looking for individuals to host "On the Road" Alumnae Regional Gatherings in Boston, Fairfield/Westport, Hartford/Springfield, and Providence!